For the first time in over 20 years, a comprehensive collection of photographs and descriptions of species in the fungal genus Fusarium is available. 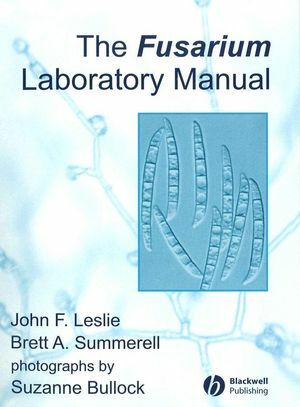 This laboratory manual provides an overview of the biology of Fusarium and the techniques involved in the isolation, identification and characterization of individual species and the populations in which they occur. It is the first time that genetic, morphological and molecular approaches have been incorporated into a volume devoted to Fusarium identification. The authors include descriptions of species, both new and old, and provide protocols for genetic, morphological and molecular identification techniques. The Fusarium Laboratory Manual also includes some of the evolutionary biology and population genetics thinking that has begun to inform the understanding of agriculturally important fungal pathogens. In addition to practical “how-to” protocols it also provides guidance in formulating questions and obtaining answers about this very important group of fungi. The need for as many different techniques as possible to be used in the identification and characterization process has never been greater. These approaches have applications to fungi other than those in the genus Fusarium. This volume presents an introduction to the genus Fusarium, the toxins these fungi produce and the diseases they can cause. John F. Leslie received his Ph.D. in genetics from the University of Wisconsin, Madison in 1979 and is currently a Professor of Plant Pathology and Genetics at Kansas State University. Brett A. Summerell received his Ph.D. in Plant Pathology from the University of Sydney in 1988 at which time he moved to the Royal Botanic Gardens (Sydney, Australia), where he currently is the Director of Science and Public Programs. Drs. Leslie and Summerell organize an annual Fusarium Laboratory Workshop in which participants receive hands-on instruction in the implementation of and the interpretation of results from the techniques described in this manual. 2. Media – Recipes and Preparation. 2.1 Media for Growing and Identifying Fusarium. 2.3 Media for Isolating Fusarium. 2.4 Media for the Preparation of Natural Inocula. 2.5 Synthetic and Semi-synthetic Media. 2.6 Media for Sexual Crosses. 2.7 Sterilization of Media and Materials. 3. Techniques for Recovering Fusarium. 3.2 Isolation Techniques – Plants. 3.3 Isolation Techniques – Soil. 3.4 Isolation Techniques – Spore Trapping and Air Sampling. 4. Techniques for Growing and Maintaining Fusarium. 4.2 Preparing Cultures for Identification. 5. Vegetative Compatibility Groups (VCGs). 5.1 History of and Genetic Basis Underlying Vegetative Compatibility. 5.2 Overall Strategy for Determining if Strains are Vegetatively Compatible. 5.3 Recovering and Identifying nit Mutants. 5.5 Common Trouble Spots – HSI, crn, and NitMs. 5.6 Characterizing a Population with VCGs. 6.1 Heterothallic, Homothallic and Pseudohomothallic. 6.3 Population Effects of Mating Type. 6.4 Male, Female, and Hermaphrodite. 6.6 Developing Female-Fertile Tester Strains. 6.7 Species Identification Through Sexual Crosses. 7.1 DNA Extraction and Purification. 7.2 PCR – Mating-Type Alleles. 7.3 Amplified Fragment Length Polymorphisms (AFLPs). 7.4 Sequence Analysis and Sequenced Loci. Taxonomy and Identification of Fusarium. 8. A Brief History of Fusarium Taxonomy. 9. Species Concepts in Fusarium. 9.1 Generic Problems in Speciation in Fusarium. 9.5 How Many Strains Make a Species?. 9.8 A Species Concept for Fusarium. 10.3 Sexual Development and Differentiation. 11. Practical Approaches to Identification. 11.2 The Diseased Plant and Its Geographic Origin. 11.3 Native and Agricultural Populations. 11.5 The Essence of Morphological Identifications. 11.6 Beyond Morphology – Sexual Cross Fertility. 11.7 Beyond Morphology – Molecular Diagnostics. 11.8 The Special Case of Fusarium oxysporum. 11.9 Differences Between Temperate and Tropical Regions.